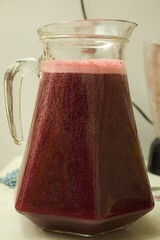 If you’ve been following me for any length of time you will know how much I have been into juicing. In fact looking back we’ve been juicing for a month now. It is amazing how we feel, how my skin glow and how people are noticing it… here’s the deal we went on a 7 day juice fast. We ate fruits and veggies along with nuts during that week and we felt really amazing. Since then I’ve lost a total of 5lb. It just isn’t enough, when we broke our fast we started back with dairy (which I’m suspicious that I shouldn’t be eating it) and grains and meat, although we only ate meat a few times a week. Since my boss bought the juicer for our office we decided that we are going to do a 30 day fast, after 30 days I’m going to evaluate things and either continue for another 30 days or be done then. Hubby is committed to doing this with me as well. We have a magic bullet so I make individual servings in the cups, blend and drink. I actually gave up coffee with this smoothie. The rest of the day it’s juice and fresh veggies and fruit. Today we start, so far so good although the lady behind me at the store with the roasted chicken? SHAME ON YOU! Don’t you know I’m fasting!? 😉 I don’t have cravings today, I’ve been juicing pretty regularly, I probably only missed a few days in the month, so I hope to not go through the same detox that I did for the week fast. If you want to read about the start of my juice journey you can read it here, and also learn more about the movie Fat Sick and Nearly Dead, which in the US you can watch FREE on hulu.com. So we’re on an adventure… more to come! Oh I’m so excited for you guys. I still say you have the worlds coolest husband! How great to have a juicer at work too, that will make this so much easier on you. Do the two of you have a lot of weight to lose? Or is it more for health and cleansing purposes? So excited to hear more about this adventure. I’ve been curious about juicing for a while. Have you seen Fat Sick & Nearly Dead yet? It’s such a inspirational movie for juicing and healthier life. I do warn you, there is a bit of evolution talk when they are talking about our bodies. I roll my eyes and go on with the movie, I certainly didn’t evolve but was created. I have PCOS which is infertility and hormone imbalance, I saw a ND for years who was going to “heal” me but I spent a lot of money and never was healed. I figured out that God wanted the credit for healing my body, so with his given fruits and veggies and their nutrition I believe in my heart of hearts he will heal me. So I’m putting my faith in him and trusting in the produce he gave us for a purpose. I’m excited to see what he does! I think a 40 day juice fast would be very biblical. God seems to have a thing for 40 days 🙂 My mom did that before, and she studied that book of Daniel the whole 40 days, and it was amazing. That is very interesting that you say that because I’m following a lady who is doing a “Daniel Fast!” Hmm… maybe you’re on to something here. I like your 40 day fast idea and I like your reading Daniel through it… It’s a plan now! Thanks lady. Absolutely love this idea! That’s an amazing testimony! Looking forward to following your journey to healing. Blessings! How exciting! I’m encouraged to hear about your journey and perseverance with the juicing. Also how things have turned arounf at your job! You just never know how God is going to bless. I know I’m really shocked actually! He is bringing a lot of blessings to my life. I’m so grateful!